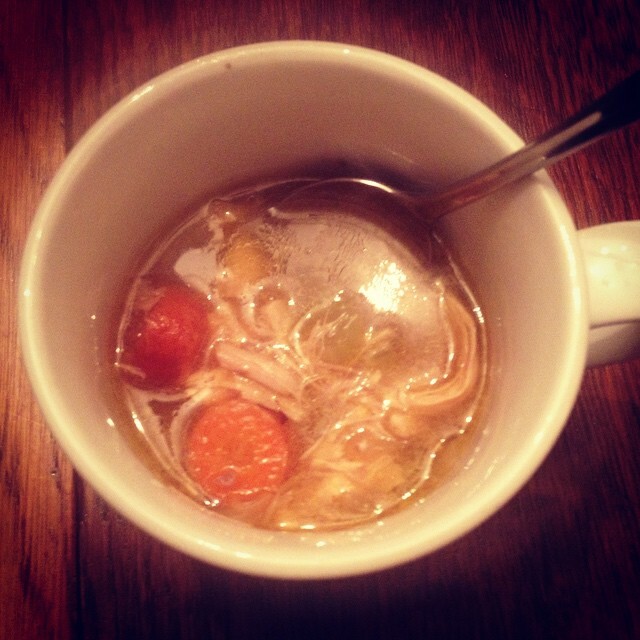 One of the easiest and tastiest soups we make during the winter is a simple Chicken Soup. At least once a week, I’ll throw this together – usually starting it in the morning and we all gather for lunch to enjoy the warming effects of this delicious fare. There are many ways to adapt this recipe – you could utilize a crock pot to cook the chicken and make the stock during the day. Give this recipe a try – it is a great way to have one of our non-GMO, pasture-raised chickens stretch into several meals! Place a pasture-raised chicken in a large pot (can be frozen). Add the halved celery and carrots, as well as the quartered onion and peppercorns (and fresh herbs if you have them). Cover the chicken with water and bring to a boil. Once boiling, set to a slow simmer for an hour (will take approximately 3-4 hours if starting with a frozen chicken). Once the chicken is fully cooked (it should be falling off the bones), strain the stock and separate the meat from the bones. At this point, you can start a batch of bone broth with the bones or save them for a future batch by tossing them in a bag and putting them in the freezer. Heat a large pot over medium heat. Melt the butter or lard then add the chopped vegetables and saute for 7-10 minutes. Add the homemade stock and bring to a boil then allow to simmer for 15 minutes. Add the cooked chicken and salt and pepper to taste. Voila! You are done and now have a delicious, nourishing soup to delight in and eat!